Protesters in Washington, D.C., were seen mobbing West Virginia Sen. Joe Manchin over his support for Supreme Court nominee Brett Kavanaugh. Chanting "shame," demonstrators surrounded the Democratic senator outside his office Friday afternoon. Manchin, a Democrat in a red state who had been considered a swing vote, announced Friday that he would vote in support of Kavanaugh despite allegations of sexual assault. Earlier in the day, President Donald Trump posted a tweet railing against the "very rude" protesters who have been flooding Capitol Hill ahead of the expected cloture vote to end debate on Brett Kavanaugh's Supreme Court nomination. "The very rude elevator screamers are paid professionals only looking to make Senators look bad. Don’t fall for it! Also, look at all of the professionally made identical signs. Paid for by Soros and others. These are not signs made in the basement from love! #Troublemakers," Trump wrote in a tweet, referencing unsubstantiated claims that Democratic donor George Soros is involved. The mention of an "elevator screamer" could be a reference to the woman who confronted Sen. Jeff Flake as he was on his way to the Senate Judiciary Committee's vote on Sept. 27. The protester, who is an activist and identified herself as a sexual assault survivor, yelled at Flake for supporting Kavanaugh, who has denied accusations of sexual assault. Trump's tweet came after Capitol Police arrested 302 people for unlawfully demonstrating in the Senate office buildings on Thursday. The names of the protesters have not been confirmed by police "due to the large number being processed," but some famous faces in the crowd have identified themselves. 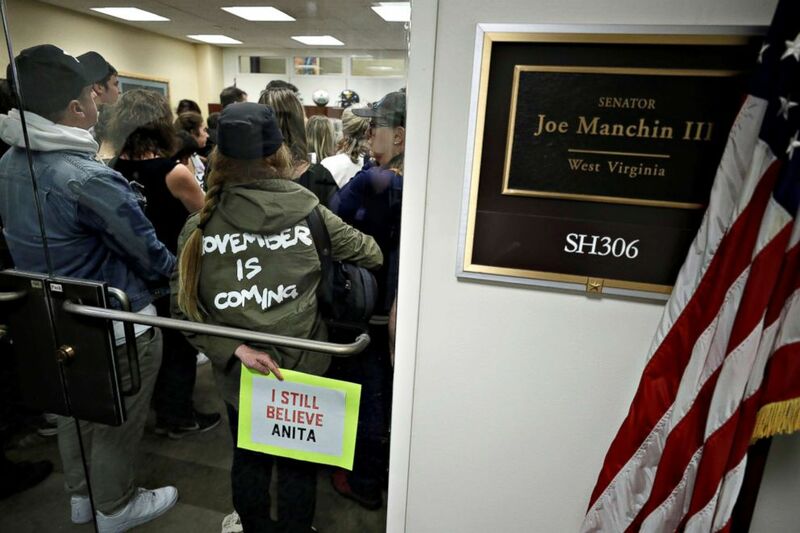 Demonstrators gather in the office of Sen. Joe Manchin (D-WV) following a procedural vote in the Senate on the confirmation of U.S. Supreme Court nominee Judge Brett Kavanaugh on Capitol Hill in Washington, Oct. 5, 2018. 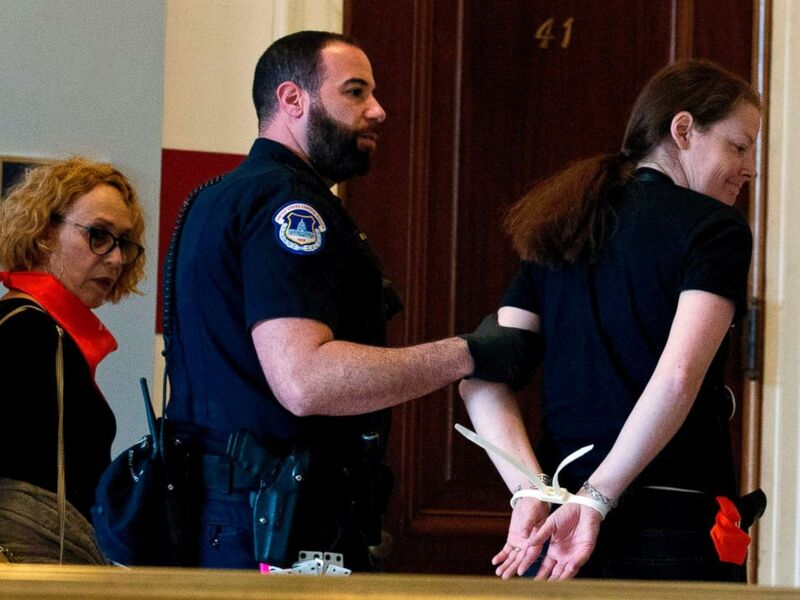 More arrests were caught on camera on Friday, as groups of protesters gathered outside Flake and Senate Majority Leader Mitch McConnell's office on Friday. The exact number of the latest spate of arrests remains unconfirmed by Capitol Police. 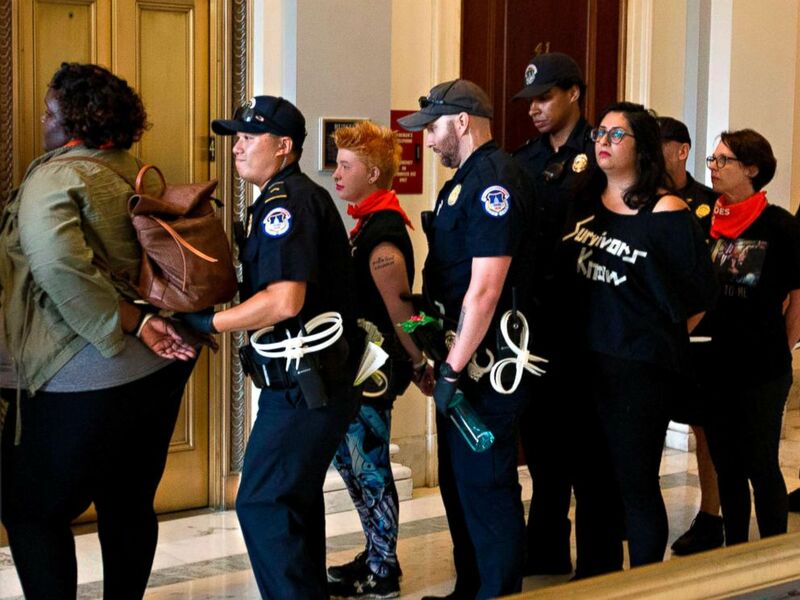 Protesters against US Supreme Court nominee Brett Kavanaugh are arrested after blocking the office of Senator Jeff Flakes, Republican of Arizona, in Washington on Oct. 5, 2018. The cloture vote passed Friday morning, meaning that debate in the Senate about Kavanaugh's appointment was closed, but the full vote is expected early Saturday evening. Protesters against Supreme Court nominee Brett Kavanaugh are arrested after blocking the office of Sen. Jeff Flakes, Republican of Arizona, in Washington on Oct. 5, 2018. On Thursday, comedienne Amy Schumer and model Emily Ratajkowski posted on their Instagram accounts about how they were arrested while protesting.